Assemblyman Peter Lopez (R,C,I – Schoharie) joined fellow assemblymembers, senators, and educators for a press conference at the state Capitol recently to announce legislation that would ensure parents are aware of their ability to decide whether their children will partake in Common Core standardized testing. "We are fortunate to have such a passionate group of people who care about their children and their futures. It is our duty and obligation as people and a legislature to engage in this bill. Parents need to know they don’t need to force more undue stress on their children,” said Assemblyman Pete Lopez, who is a member of the Committee on Education. The Common Core Parental Refusal Act (A6025) is currently being considered in the Committee on Education, and has bipartisan support in the Assembly and the Senate. 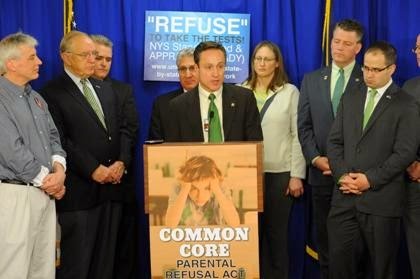 The bill would require schools to notify parents of students in New York of their ability to opt out of taking Common Core standardized tests. Students opting out of these exams would not negatively impact the students, teacher or schools. “We want teachers and parents to do what they were meant to do, which is inspire young people to reach their full potential. They cannot do that if they are forced to teach to a one-size-fits-all test or send their children into unnecessary, stressful situations,” concluded Assemblyman Pete Lopez.